Janz Tec (Germany) has developed the emIOT-A/iMX6 gateway. It connects CAN FD networks with wireless communication networks such as LTE and WLAN. 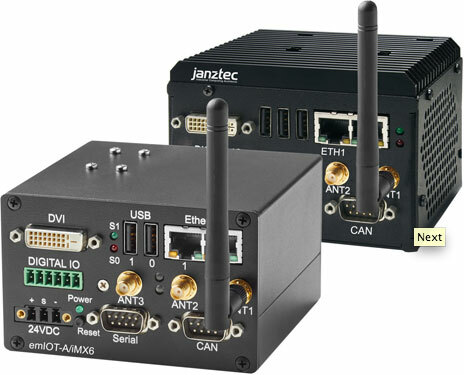 Besides its CAN-PMC/FD and CAN-PCIe/FD boards, Janz Tec offers an IIoT (Industrial Internet of Things) gateway with CAN FD interfaces. The CAN FD interface complies with ISO 11898-1:2015. The temperature range of -40 °C to +75 °C allows using the device in harsh environments. The product is designed for applications in vehicles, construction, and agriculture machinery as well as in medical devices, and other embedded control systems. Janz Tec exhibits the IIoT gateway at the Embedded World tradeshow (hall 2, stand 411). It will be available by end of the year. The i-MX6 quad-core central processing unit (CPU) by NXP provides sufficient computing power for the gateway functionality. The German supplier offers application-specific versions and software integration services. The CAN FD protocol is reliable and the physical layer feature robustness. Therefore, embedded CAN FD networks can be used in wide variety of application fields. Due to its footprint, the gateway is suitable for applications with limited space.